This article originally appeared in the Summer 2018 issue of Pennsylvania Heritage. So wrote a distraught Hannah Penn to longtime friend and advisor Thomas Story on July 30, 1718. The remains of her husband were taken to Jordans Meeting House in Bucking- hamshire and buried there on Au- gust 5 beside his first wife Gulielma. Quakers and non-Quakers alike attended the funeral. Jordans is a quiet place, a peaceful place. In a grassy meadow surrounded by tall hedgerows, the burial ground beckons you to contemplate its occupants. The Quaker meeting house next to it equally welcomes you to enter and engage in thoughtful reflection. That’s as it should be. This is a special place, because the cemetery holds the remains of William Penn (1644–1718), founder of Pennsylvania and a seminal figure in English and American history. The year 2018 is the 300th anniversary of his death. Commemorations will be held in America, notably at Pennsbury Manor, Penn’s Pennsylvania home near Morrisville in Bucks County, and in England at Jordans Meeting House. I recently made a pilgrimage to Jordans as a student and ardent advocate of William Penn. While working as an archivist with the Pennsylvania State Archives, one of my responsibilities was to care for his 1681 Charter from King Charles II for the land that became Pennsylvania. I gained an appreciation for the founder by studying that document and other Penn-related items at the archives, such as the December 1682 Great Law, the first set of statutes he presented to his legislators, and his October 1681 List of First Purchasers, containing the names of Quakers who bought land in his colony. Pennsylvania, Penn’s self-proclaimed “Holy Experiment,” was a model for religious toleration in the New World, a place where people of different faiths could worship privately without government intervention. Penn also incorporated his Quaker principles of pacifism, freedom of consciousness, and the right to peaceably assemble into the government of his new colony. Visiting Penn’s grave to pay tribute to him was for me a fulfilling moment in a lifetime of studying this eminent man. I’ve learned a lot about Penn over the years, especially how he was born wealthy, the son of Admiral Sir William Penn (1621–70); how he defied his father, rejected conventional English ways, and became a member of the Religious Society of Friends (Quakers); and how he petitioned King Charles II for land in the New World for his persecuted sect. Penn visited his colony twice, in 1682–84 and 1699–1701. As Pennsylvania was a land grant from the king to an individual, Penn was constantly beleaguered by interests in England who wanted to place it under direct royal control as part of a Parliamentary effort to impose more uniform British authority and order in its North American colonies. In the fall of 1701, he hastily left for London to defend his lands. Before doing so, he wrote a new constitution for Pennsylvania, the Charter of Privileges, a watershed document. This liberal constitution reorganized authority between three branches of government (executive, legislative and judicial), guaranteed religious freedom, and strengthened the separation of church and state. The founding of Pennsylvania and the Holy Experiment, its population by many religious and ethnic groups, and the Charter of Privileges is usually where the story of William Penn ends in most American history classes. What happened to Penn when he left Pennsylvania for the last time? I knew he had a debilitating stroke in 1712, eventually dying in 1718, but not much more. Was he able to defend his colony from a takeover by royal factions? How did he manage Pennsylvania from afar? Where did he live? What was his life in England like after 1701? With these questions in mind, I stepped off a train in Burnham, Buckinghamshire, about 25 miles from London. I was greeted by members of the Chilterns Area Quaker Meeting (Jordans is one of seven meetings in the region). I enjoyed a short drive through a suburban part of England steeped in history. On deep ancient roads, we passed Burnham Beeches, an extensive woodland area since the last Ice Age, occupied by humans since the Iron Age, and purchased by the City of London in 1880 to protect and preserve it. It’s easy to see why Chilterns has been officially designated by England as an Area of Outstanding Natural Beauty. Our car then turned off Welder’s Lane in Beaconsfield and on to the Jordans Meeting House grounds. The Society of Friends, founded around 1647 by visionary George Fox (1624–91), initially met in members’ homes, because it was illegal for non-Anglicans to have meetinghouses. Mainstream English society regarded the sect with derision, calling them “Quakers” for the way they trembled when filled with the spirit of God. Chilterns-area Friends met in the kitchen at “Old Jordans,” the farmhouse of Friend Thomas Russell, who had purchased the property in 1618. Old Jordans dates to the Middle Ages and is possibly named for Jordan De Ran, an ancestor of William Gardiner, the original landowner. The farmhouse is just a few hundred yards from the meetinghouse. After King James II’s Declaration of Indulgence in 1687, permitting Quakers and other Protestant nonconformists to legally worship, the local Friends built Jordans, one of the oldest meetinghouses constructed specifically for that purpose. In continuous operation since 1688, the small brick building is of Flemish bond, sensible and unadorned. English law prohibited the interment of Friends and other nonconformists in the consecrated ground around churches. The land’s use as a burial ground dates to 1671, with the funeral of Russell’s granddaughter Elizabeth. I immediately walked to Penn’s gravestone. It is plain and carved with just his name and death year. The stone also includes the death year of his second wife Hannah Callowhill (1671–1726), buried directly above him. His first wife Gulielma Springett (1644–94) and her mother Margaret Penington (1624–82) lie to the right. Further on are the graves of 10 Penn children of both wives, most of whom died in infancy, a testament to the high child mortality of the times. Penn begat a total of 14 children; only five, two from Gulielma and three from Hannah, reached past age 21. His male line has since died out, and only a few of his descendants are alive today. Behind the children lies one of the few who did reach adulthood, John (1700– 46), William and Hannah’s first son. Known as “the American,” he was born at the Slate Roof House in Philadelphia (at Second and Walnut, demolished in 1867), just after the Penns arrived in the colony for the last time. I would learn that Penn’s final years in England were troublesome. His challenges included the attempts by royal interests to end his ownership of Pennsylvania, along with personal financial woes involving embezzlement, extortion, and a protracted lawsuit by his advisor Philip Ford and later Ford’s family. There was additional bickering and deceit across the Atlantic in the government of Pennsylvania. William and Hannah also witnessed personal tragedy, from the deaths of their children to the scandalous behavior on the part of his son to Gulielma, William Penn Jr. Upon their return to England in December 1701, the Penns lived at various places near Bristol and London and at the family home in Warminghurst, Sussex. Penn wanted to be close to the royal government to actively lobby for his colony. England itself was undergoing a period of transition, including involvement in the War of the Spanish Succession beginning in 1701, the death of King William III, and the coronation of Queen Anne (1665–1714) in early 1702. Anne’s reign was marked by bitter contention between Whigs and Tories in Parliament, especially over choosing her successor. Penn’s advocacy for Pennsylvania would seem petty to the new queen and Parliament. For centuries, English monarchs often granted lands to loyal subjects, usually aristocrats, as payment for service to the crown. The grantee, or proprietor, owned the land outright and had the authority to manage it as he wished. In the 17th century, Charles I and Charles II continued this practice with England’s lands in the New World. This included Maryland (1632), the Carolinas (1663), New Jersey (1664), New York (1664), and Pennsylvania and Delaware (1681). New York returned to royal control in 1685 and New Jersey in 1702. By the 1690s Parliament felt that all English lands in America should be under direct royal control for ease of management. The 1701 threat sending Penn back to England was largely instigated by the Royal Board of Trade and, in particular, Robert Quary (1644–1712), surveyor general for the customs of New Jersey and Pennsylvania (and in 1703 surveyor general of all of British America). In this capacity, Quary served on the provincial councils of several colonies simultaneously-New York, New Jersey, Virginia, Maryland and Pennsylvania. Quary charged, among many other things, that Quakers dominating Pennsylvania’s legislature refused to create a militia to defend the colony by land or sea, that trade with pirates was carried on at the port of Philadelphia, and that the assemblies of the “three lower counties” of Delaware managed by Penn complained that they wanted independence from Pennsylvania. These charges were essentially true. Penn fought back by presenting a proposal to the Board of Trade to create a confederation of the proprietary colonies utilizing a common militia administered by the crown. Civil authority would be left to the individual colonies. He also permitted Delaware to become a separate colony in 1704. Parliament, occupied with more critical matters, ignored the Board of Trade, Quary and Penn. Quary and the board gave up after Penn, in a conference with Queen Anne at Bath in October 1702, persuaded her to his point of view. Attempts to take over Penn’s colony would continue well after his death. We entered Jordans Meeting House. The interior is warm, intimate and welcoming. Ancient wood paneling is everywhere. The building survived a serious fire in 2005, taking part of the original 1688 roof. Fortunately, the roof’s original inner plaster layer remained largely intact and was easily repaired. I chatted over a cup of tea with the staff about William Penn, his legacy, and the Quakers of today. A fundamental belief of the Friends is that there is a spark of God present in all human beings, male or female, and they must listen to his spirit in their hearts to lead them to truth. This truth serves to guide their daily lives. Friends are also tolerant of other religions and are pacifists. Penn is a revered figure in Quaker history, for his writings and teachings on how one should conduct one’s life have remained relevant to them. Chief among his works is No Cross, No Crown, a 1669 essay espousing his Christian philosophy, written while he was imprisoned in the Tower of London for his Quaker beliefs. In 1693 he published Some Fruits of Solitude, a series of useful epigrams. He was a key figure and spokesperson for the Friends, especially after leader George Fox died in 1691. The original meeting room is small, about 27-by-18 feet, with wooden benches on all four sides surrounding a table in the center. The brick floor is original, and I got goosebumps hearing that Penn himself walked on those bricks. Friends, then as now, do not have formalized religious services. Rather, they meet at an appointed time and sit in the main room of their meetinghouse until the spirit of God moves them to speak. These spoken contributions to the group, referred to as “ministry,” were frequently Bible-based in former times. More often these days, members draw upon a wide variety of sources to offer guidance for their daily lives and dealing with current affairs. The interior of Jordans reflects the simplicity of Quaker life. Photo by Linda Ries. When he inherited his father’s fortune upon the admiral’s death in 1670, William Penn became a wealthy man. He also sought to earn money from his colony through land sales and quitrents, but land sales were scarcely profitable and quitrents brought only resentment and resistance from his colonists. In any case, management of money and finances was not Penn’s strong point. He naively trusted others to do this, often signing legal papers without reading them first. Beginning in 1669, he hired Philip Ford, a fellow Friend, to manage his inherited lands in Ireland. Ford kept the accounts and charged Penn exorbitant amounts for his work. By the time Penn received his colony in 1681, he was already heavily in debt to Ford. In an attempt to redress this in the 1690s, he secretly mortgaged Pennsylvania to the accountant, making Ford in effect the colony’s legal proprietor. Ford died in January 1702; in his will he had named his widow Bridget and two other Quakers as trustees of Pennsylvania. Penn attempted to persuade Bridget to not probate the will and continued to act as the colony’s proprietor. Confusion occurred in Pennsylvania when the provincial assembly learned of the founder’s financial woes - and more so when Philip Ford Jr. wrote to them claiming to be proprietor. In April 1705 an exasperated Penn declared to James Logan (1674–1751), Pennsylvania’s secretary of the Provincial Council and one of the few he could trust, “My head & heart are filled sufficiently with trouble.” The matter was at a standstill until October 1705, when the Fords took Penn to Chancery Court for nonpayment. For several years, a number of legal actions ensued between both parties. Penn tried several strategies to gain funds, among them the idea to approach Queen Anne to sell his colony to the crown. Things were not much better across the sea. Quaker David Lloyd (1656–1731), whom Penn sent to Philadelphia in 1686 to serve as attorney general (he was also a member of the General Assembly and later first chief justice of the Pennsylvania Supreme Court), openly criticized Penn’s abilities to manage his government. He led a faction within the colony to return Pennsylvania to the crown, declaring he was Philip Ford’s agent. In addition, there was trouble with William Penn Jr., a rebellious child born in 1681 just after Penn received his charter. Sent by his father in late 1703 at age 22 to represent him in the colony and serve on the Provincial Council, young Penn openly renounced Quakerism, dressed extravagantly, and freely spent his father’s money carousing at a tavern in Philadelphia. He returned home within just a few months. After failed attempts to get his son into the military or elected as a member of Parliament, Penn gave up, their relationship thereafter strained. After his father’s death, young William petitioned the Pennsylvania Assembly to claim himself the rightful owner of Pennsylvania, but failed, as his stepmother Hannah Penn became the colony’s proprietor according to the terms of her husband’s May 1712 will. The colony would pass on to her children, not Gulielma’s. William Penn Jr. died in 1720, supposedly in France. In 1707, desperate for funds, Penn sold his family home, Warminghurst. This gained him only a pittance in the face of mounting debts. Finally, in early 1708, unable to pay his creditors, Penn entered Fleet Prison, the notorious London jail for debtors. He spent about 10 months there, an embarrassing situation no doubt for the renowned Quaker leader and proprietor of Pennsylvania. In October of that year, he settled with the Ford family. In exchange for 7,600 pounds, the Fords gave up all rights to the colony. Though Penn kept Pennsylvania, it increased his indebtedness. After selling Warminghurst, the Penn family moved to a small but comfortable home in Ruscombe, near Reading in Berkshire. From Ruscombe, they would attend Friends meetings in Reading, often visiting Jordans as well. And there at Ruscombe in December 1712, as Penn prepared again to approach Queen Anne about selling his colony to the crown, he suffered the first of several apoplectic strokes rendering him an invalid the rest of his life. He could speak a few coherent sentences and walk, but he could not write well and had memory problems. Penn slowly got worse over the next several years, and he quietly slipped away in the early morning of July 30, 1718. He was 73 years old. Hannah shouldered the burden of dealing with his debts and assembled a team of Friends who helped her through legal matters. She also worked closely with James Logan across the sea to manage the colony. After Hannah’s death in 1726, Penn’s sons John, Thomas (1702–75) and Richard (1706–71) became the proprietors. They were Anglicans and did not share Penn’s vision of the “Holy Experiment.” They viewed Pennsylvania as a money-making scheme through land speculation and sales, choosing to try and pay off Penn’s debts and not return the colony to the crown. They overcame several more attempts during the 1700s to move Pennsylvania under direct rule. It remained under the family’s control until the American Revolution. With the Divestiture Act of 1778, the new state’s General Assembly relieved the Penn family of all of its rights to Pennsylvania and compensated them. I quietly sat on one of the benches in the meeting room at Jordans, imagining the spirit of Penn next to me. I would be moved to tell him how badly I felt about the final years of his life. At a time when he should have been enjoying the accomplishments of his “Holy Experiment,” he suffered from sickness, financial problems, and attempts to take over his colony. What would he be moved to tell me? I thanked the Jordans staff and we left the peaceful grassy meadow with one last look at Penn’s tombstone, my pilgrimage over. On the train, reflecting on all I had witnessed, I was humbled. I had renewed my appreciation for Penn’s humanitarianism and had a better understanding of his tragic final years. I then realized what William Penn would be moved to tell me. No doubt he would quote a passage from Some Fruits of Solitude: “The truest end of Life is to know that Life never ends. . . . Tho' Death be a Dark Passage it leads to Immortality. . . . And this is the Comfort of the Good, that the grave cannot hold them, and that they live as soon as they die. . . . For Death is no more than a Turning of us over from time to eternity.” He would kindly assure me that his many troubles were but earthly and remind me that his spiritual ministry to the Friends, the legacy of Pennsylvania, and the “Holy Experiment” transcend his death. As a Pennsylvanian, I am grateful Jordans is preserved largely intact through the loving care of generations of meeting members. The historic site is a tangible and powerful reminder of William Penn — truly “A Man, A Scholar, A Friend; A Minister.” Today his legacy lives on at his resting place at Jordans, in Pennsylvania, and wherever his contributions have helped shape our world today. The first place to begin when studying the original records of William Penn is the five volume The Papers of William Penn, 1644– 1718, edited by Richard S. Dunn and Mary Maples Dunn (University of Pennsylvania Press, 1982–1987). The collection brings together for the first time all known letters and documents relating to the founder, each rigorously researched and annotated. The fifth volume consists of Penn’s published writings, such as No Cross, No Crown and Some Fruits of Solitude. Also edited by the Dunns, The World of William Penn (University of Pennsylvania Press, 1986) contains 20 essays about Penn and his times by noted scholars on both sides of the Atlantic. The most recent book exploring Penn’s religion and politics is Andrew R. Murphy’s Liberty, Conscience and Toleration: The Political Thought of William Penn (Oxford University Press, 2016). Similarly, Rosemary Moore’s The Light in Their Consciences: Early Quakers in Britain, 1646–1666 (Pennsylvania State University Press, 2000) examines founding principles and philosophies of the Friends. Lorett Treese’s The Storm Gathering: The Penn Family and the American Revolution (Pennsyl- vania State University Press, 1992) picks up the story after Penn’s death and follows the fortunes of his sons John, Thomas and Richard. Jordans Meeting House and the cemetery in which William Penn and his family are interred are located on Welders Lane in Chalfont St. Giles, Buckinghamshire, England. For information on visiting the site, see jordansquakercentre.org. Reconstructed on the remains of William Penn’s country estate along the Delaware River in Bucks County, Pennbury Manor interprets the life and career of Pennsylvania’s founder and first proprietor. 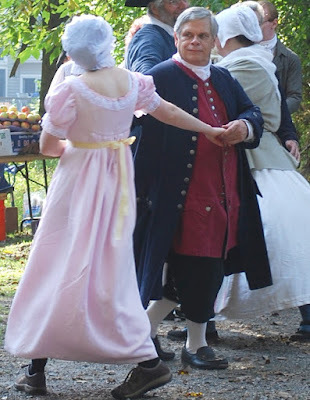 Living history programs, guided tours, award-winning exhibits, buildings, furnishings, artifacts, gardens and animals offer an informative glimpse into Penn’s world and early Colonial life in Pennsylvania, reflecting the ethnic and cultural diversity of the colony. In 2018 Pennsbury Manor will be holding special events and exhibits commemorating Penn’s legacy for the 300th anniversary of his passing. Linda A. Ries is editor of Pennsylvania History: A Journal of Mid-Atlantic Studies. She previously worked at the Pennsylvania State Archives, retiring in 2014. This is her fifth article for Pennsylvania Heritage. With a new month just around the corner, the August program page is up and running. Stay tuned for update posts on August 3 and August 17. Events scheduled for this weekend and next week are listed below. Summer is the busiest time for most sites on the PHMC's PA Trails of History, with school tour seasons (fall and spring) close behind. People show up for special events and regularly scheduled guided and self-guided tours. Many sites have expanded hours during the late spring and summer to accommodate more visitors. Families of various shapes and sizes make sites a destination or stop in on their way to other vacation spots. This past month, I took note of quite a few social media posts about different ways visitors are experiencing our sites. In early July, Landis Valley Village and Farm Museum put out a call on social media for help with the annual flax harvest. This living history opportunity drew a great public response and provided lots of new hands to assist staff and regular volunteers with the work. The site reported that a visitor from England heard about the project while touring on one of the work days and returned in the evening to help. The helpers were well cared for and also visited the museum's textile exhibit building to take a break and learn how the flax plants they were harvesting would be turned into linen thread and cloth. The photos from the two work events are wonderful; I've shared one above, and you can find others in a photo album on Landis Valley's Facebook page. Several Trails of History sites were visited in July by groups with an artistic interest in the landscape and buildings. 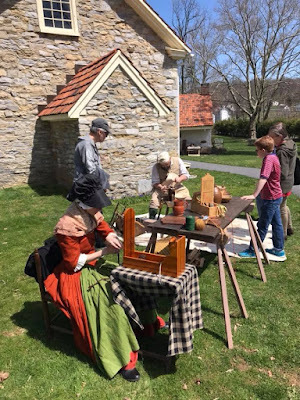 In addition to Cornwall Iron Furnace in the post above (you can see some of the group's paintings in a follow-up post), Graeme Park and Landis Valley Village and Farm Museum also hosted plein air painters. Landis Valley was also the venue for a workshop taught by Jennifer MacNeill Photography. As part of emergency planning and preparedness, historic sites and museums often work with their local fire companies to familiarize first responders with their collections and historic structures. 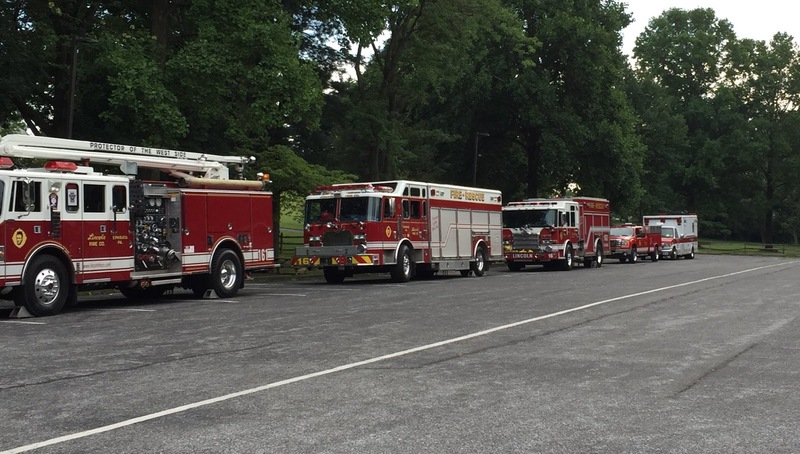 Earlier this month, more than 60 volunteers from the Pioneer, Akron, and Lincoln Fire Departments in Lancaster County visited Ephrata Cloister for a special training session. In addition to the training, it gave the site an opportunity to thank these volunteers for their service to the larger community. Other special guests at Trails of History sites this month included: descendants of Dr. Joseph Priestley's brother Timothy at the doctor's home in Northumberland and PHMC's 2018 Keystone summer interns (some of them at least) at Conrad Weiser Homestead and Ephrata Cloister. (On a side note, Old Economy Village and Pennsylvania Lumber Museum posted photos of their summer interns for #NationalInternDay on July 26). Monday, July 30, marks the 300th anniversary of the death of William Penn, founder of Pennsylvania. 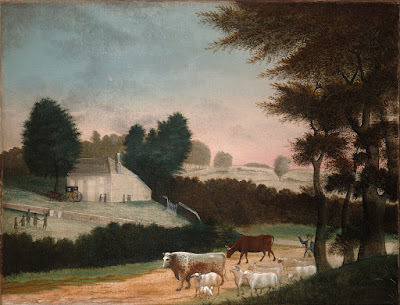 As you probably know, PA Trails of History site Pennsbury Manor interprets Penn's multi-faceted legacy as well as what it was like to live and work on a late-17th- to early-18th-century estate. 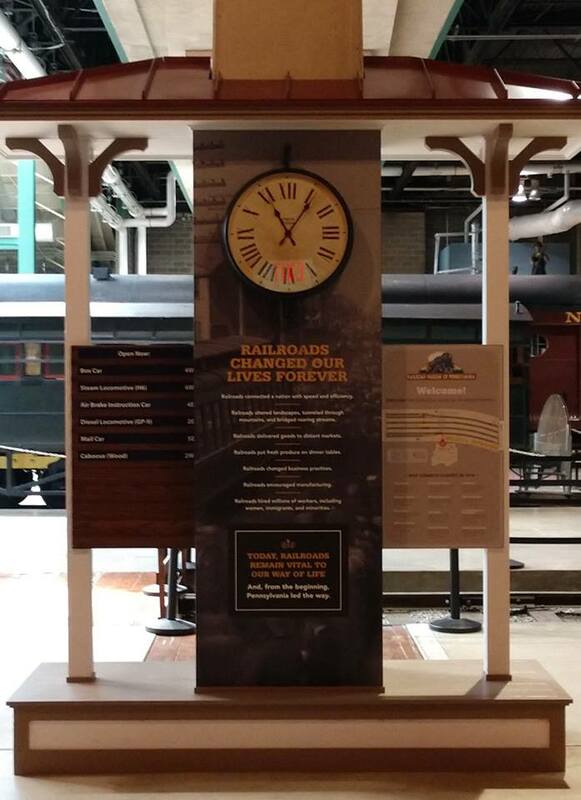 (Read about Penn's legacy in this article from Pennsylvania Heritage.) As part of the anniversary observance, Pennsbury will host a panel discussion and luncheon on September 29, featuring Gov. Tom Wolf and former governors Tom Ridge, Mark Schweiker, Ed Rendell, and Tom Corbett (read more from PhillyVoice.com). Tickets are available now on the Pennsbury Manor website. Proceeds from the event will support educational programs at the site. Aug. 1: Kids Summer Quest—the Lackawanna County Library System is bringing a Summer Quest to the museum. Visit the museum anytime between 10 am and 2 pm to take part in fun activities focused on this summer's music theme (more info on the library system website). Admission is free. July 28: Bushy Run Market—this open air market features a changing variety of vendors. The concession stand will have drinks and light fare. Free for visitors and vendors. 8 am-noon. Aug. 1: Sawmill demonstrations—the site's water-powered up-down sawmill will be demonstrated at 11 am and 2 pm. July 28-29: Historic Pithole open. Admission charged. 10 am-4 pm. July 28: Something More Saturday—in addition to the regular offerings, there will be hands-on activities for fun and learning. Included in regular admission. 10 am-3 pm. Aug. 2: Happy Hour with the Historian—Charlotte Filiciatto will present "The Quaker Response to the Civil War," exploring Graeme Park's Penrose family and their neighbors during the American Civil War. Admission is $5, free for members. Food and drink available for purchase starting at 6 pm; lecture starts at 7. UPDATE: this event is cancelled (per GP Twitter acct); there is another scheduled for Aug. 30 (see August program page for details). July 28-29: Civil War Weekend—the site is transformed into a rural Pennsylvania village during the Civil War, with reenactors portraying soldiers and civilians (more info). The event takes place rain or shine (online tickets are not refundable). Admission charged; tickets are available online from Brown Paper Tickets. Food will be available for purchase at the museum store. (Check out Landis Valley's Facebook page for posts on what to expect at the event.) 10 am-4 pm both days. July 29: Special Sunday Programming—meet some of the animals that call Pennsbury home. Included in regular admission. 1-4 pm. July 28: Trail Work Bee—as reported in the July 13 Trailheads post, the museum grounds now include the Webber Cabin, home to Bob and Dotty Webber for many years. Bob Webber was known for many things, among them his work to establish numerous hiking trails in Pennsylvania's forests. A new trail will connect the Webber Cabin to the museum's existing Sustainable Forestry Trail. The work to develop that trail is being done by hand and help is needed. If you are willing and able to assist, please call the museum at 814/435-2652 to sign up. July 28: History on a Hayride—hear tales of local characters and enjoy the museum grounds (more info on the Facebook event page). Cost is $10 per person, $8 for members. 10 am-2 pm. July 27: Summer Fridays—Fridays are "Pay as You Wish" this summer during regular hours, 9 am-5 pm. Also today, 12:15-1:15 pm, staff from the Bureau of State Parks will present a Learn at Lunchtime program, "Discover PA Songbirds and Cavity-nesters." We're more than halfway through July, but there's still a lot to do! Events below are today, July 20, through the end of the month. Look for the August listings around the 30th. July 20: Stoke the Fire Fundraiser—help support the Bonfire at the Furnaces event and enjoy an evening out at POSH at the Scranton Club. Information and advance tickets are available online from Brown Paper Tickets. 6-9 pm. July 21: Colonial Dancing—learn about an important aspect of 18th-century social life. Takes place in the Visitor Center and is free to the public. 11 am-3 pm. July 28: Bushy Run Market—this open air market features a changing variety of vendors (last Saturday of the month, May-September). The concession stand will have drinks and light fare. Free for visitors and vendors (prospective vendors should contact market@bushyrunbattlefield.com to discuss participation). 8 am-noon. July 25: Sawmill demonstrations—the site's water-powered up-down sawmill will be demonstrated at 11 am and 2 pm. Saturdays and Sundays: Historic Pithole open. Admission charged. 10 am-4 pm. Through August 17: Tall Ship Summer Camp—sail on board the schooner Lettie G. Howard and learn all kinds of nautical skills. Week-long camp sessions are still booking, geared for ages 10-14--except for Tall Ships Summer Camp RETRO week (July 2-6), which is designed for grown-ups! Details and registration info are on the website. Sundays in July—the site is open for tours every Sunday, through mid-October. Admission is charged. 12:30-4 pm, with tours at 1 and 2:30. July 22: Science and Mystery: 18th-Century Food Preservation and Storage—the Summer Kitchen will be up and running with a special program today. Hope Lodge is home to one of the largest and most intact food storage cellar networks among Georgian style homes constructed before the American Revolution. Experience the sights and smells of a busy, fully functional 1790 kitchen as culinary history interpreter and Hope Lodge intern Erin Agnew demonstrates the process of preparing food to last through the cold season. Cheesemaking, pickling, curing meat, and making fruit preserves is on the menu! Visitors participating in the 1:00 & 2:30 mansion tours will have the opportunity to learn the science and guesswork that went into keeping the residents and staff at Hope Lodge fed through the non-growing season. July 25-27: History Camp—this year's theme is "The Priestley Family in Northumberland." The program offers a wide range of activities for first through sixth graders (more info). Fee charged; registration deadline is July 23. 9 am-noon. July 28-29: Civil War Weekend—the site is transformed into a rural Pennsylvania village during the Civil War, with reenactors portraying soldiers and civilians (more info). The event takes place rain or shine. Admission charged; tickets are available online from Brown Paper Tickets. Food will be available for purchase at the museum store. 10 am-4 pm both days. July 23-27: Summer History Camp—kids ages 6 to 12 will explore the village and learn about life and work in the community (more info and registration form. Register by July 5. 9 am-12:30 pm. July 21: Blacksmithing Class: Beyond the Basics—keep an eye on the website for details. 10 am-1 pm. July 28: Broom Making Class—check the website for details. 10 am-4 pm. Special Sunday Programming—chat with the gardeners and the brewers (7/22); meet some of the animals that call Pennsbury home (7/29). Included in regular admission. 1-4 pm. July 23-27: History Camp—this camp is for students who've finished grade 1, 2, 3, 4, or 5 who want to learn about life 300 years ago. Registration is required (info and online registration are on the website). July 20: Registration deadline for Boot Camp for Kids—this year's Boot Camp will be held Aug. 4 (more info and registration forms. July 20: Lecture—helicopter pilot Ed Ramon will talk about his two tours of duty in South Vietnam, 1966-1968, in a talk titled "A War We Can't Forget." 6:30-7:30 pm. July 21: Escape Room—work as a team (of up to 10 people) to solve your mission and escape the barn. Two 60-minute games offered per day. Cost is $10 per person. 10 am-2 pm. Through Aug. 24: Summer Fridays—Fridays are "Pay as You Wish" this summer. For the full listing of July programs, including planetarium shows, Nature Lab programs, StoryTime, and Learn at Lunchtime, please visit the museum's calendar of events. Be sure to check last week's post for events coming up between today and July 19 or the July program page if you're planning further ahead. To see additional photos from the Bark Peelers' Festival, I've saved some on a separate page or visit the PA Lumber Museum's Facebook page. I'm somewhat embarrassed to admit that my visit to the Pennsylvania Lumber Museum's Bark Peelers' Festival last weekend was my first time at this long-standing annual event. It won't be my last, I hope. I am always inspired by the work of my colleagues at PHMC's historic sites and museums, staff and volunteers. These major public events, however, are a reminder of the tremendous effort that goes into welcoming visitors and showcasing the gems that make up the PA Trails of History. Gorgeous weather aside, it was a treat to see all the activity on site and to experience the sawmill in operation. 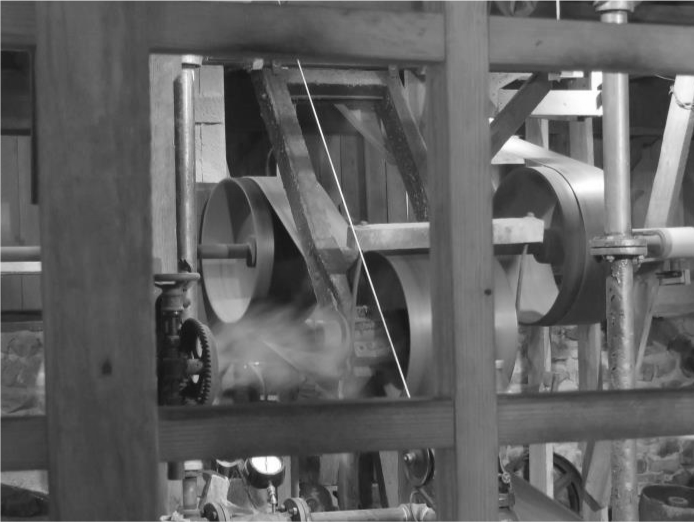 I had seen video and photos but to be there in person and feel the rumble of all the machinery (steam engines below and various saws on the main floor) was something new. The festival is inspired by the bark peelers' "conventions" of the late 19th and early 20th centuries where loggers and others got together to celebrate the Fourth of July and compete in tests of skill. Among the many activities are blacksmithing demonstrations and displays of "woodhick" skills by Bill Simcox and family. The full program from the festival is available online and I highly recommend it for reading more about the event, the museum, and the history of logging and forest management. A special part of this year's Bark Peelers' Festival was the dedication of the Bob and Dotty Webber Cabin, built in 1961 overlooking Pine Creek (near Slate Run). The Webbers lived "off the grid" in this cabin, but as one of the museum board members who knew them told me, they were far from isolated. Bob Webber was instrumental in building forest and hiking trails throughout the region and inspired many current and former staff of the PA Dept. of Conservation and Natural Resources (DCNR). (You can read more about this project of the museum's website.) The Webbers received lots of visitors at their 500-square foot cabin and are fondly remembered by family and friends. Bob Webber passed away in 2015, and there was considerable concern about what would happen to the now-uninhabited cabin. 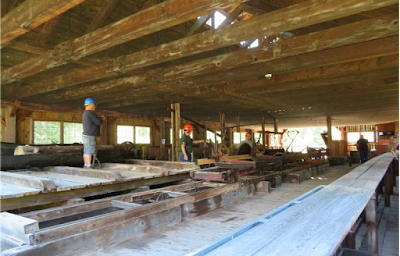 A joint venture between DCNR and the PA Lumber Museum, the PA Lumber Museum Associates (PALMA), and PHMC resulted in the cabin's disassembly at its original location and reconstruction on the grounds of the Lumber Museum. Speakers at the ribbon-cutting ceremony spoke movingly about the Webbers and their impact on Pennsylvania's forests and the people who spend time in them. Plans for the cabin include the installation of exhibit panels to tell more of the story of forest stewardship, forest recreation, and ways all of us can help save the forests (and other parts of our environment) for future generations. 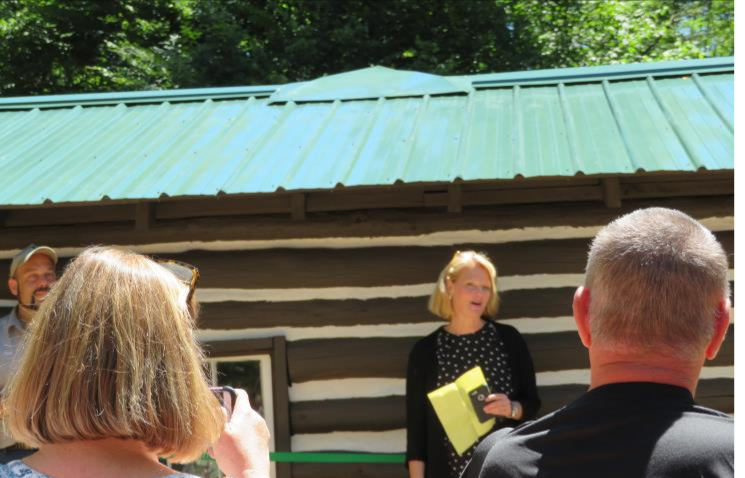 During his remarks, Jim Hyland, a forest program specialist with DCNR who was one of the guiding forces behind this project, talked about the process of moving the cabin. As part of clearing the cabin from its original site, the team sorted through items that had been left in a shed. 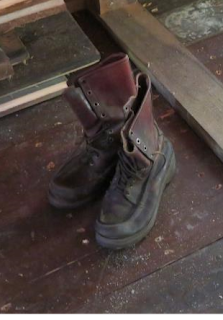 Among the finds were two pairs of well-worn boots that had belonged to Bob and Dotty Webber. 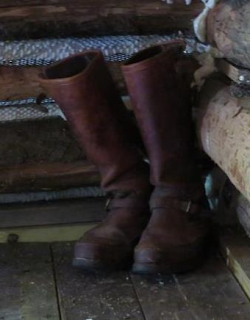 Placed in the cabin after the ribbon was cut and visitors were allowed in, these boots were tangible reminders of the people who built the cabin with their own hands and lived in it for decades. And, for me, they were also a reminder of the power of objects to help us tell stories about the past, the present, and the future. I'd like to thank everyone who made this project possible and all the people who came out to show their support. It was an inspiring moment that I hope will continue to resonant for others as it does for me. So much to do...This list covers today, July 6, through July 19. Visit the July program page for events later in the month. July 7: Annual Classic Car Cruise—classic and custom cars, live music, food, drink, and more. Event is free; regular admission applies to visit the exhibits. 11 am-3 pm. 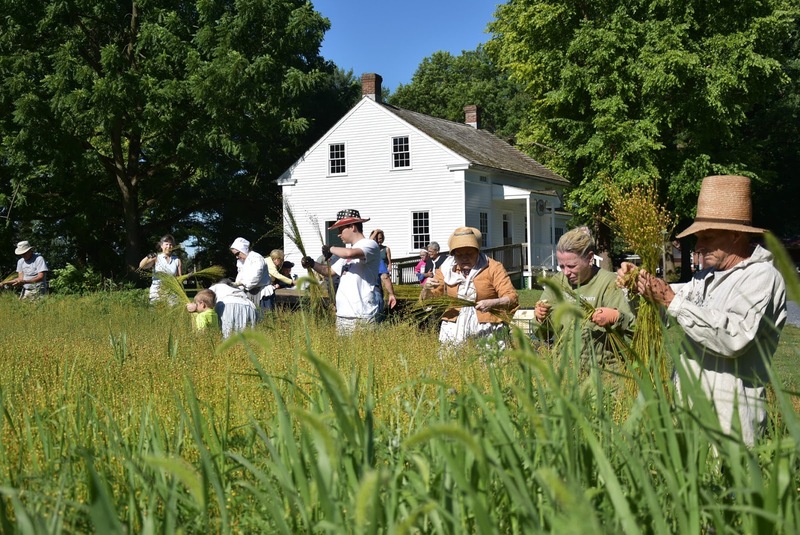 July 8: Living History Sunday—enjoy a summer afternoon at the homestead learning about life in the Tulpehocken. Admission is free. Noon-4 pm. July 11, 18: Sawmill demonstrations—the site's water-powered up-down sawmill will be demonstrated at 11 am and 2 pm. July 12, 19: Discovery Days—children age 8-12 will experience nature, perform experiments, discover history through artifacts and exhibits and so much more. Fees charged and registration is required (program brochure and registration form). Deadline was late June, so contact the site to see if space is still available. 9 am-4 pm. July 16: Annual Flagship Niagara Golf Open—details and registration are on the website. Part of your registration fee is tax-deductible and supports the Flagship Niagara League's programs. Must be at least 21 years old to attend. July 15: Living History Sunday—explore the sympathies and arguments of loyalists and revolutionaries as Elizabeth Graeme Fergusson decides what she must do (more info on the website). Noon-3 pm (presentation at 2). July 7 and 11: Lend a Hand on the Farm—there's flax to be harvested and Landis Valley needs some helping hands to pitch in. Learn how flax becomes linen and help with the first step in the process, pulling the flax plants out of the ground. No tools will be used (no cutting) but those interested should bring good garden gloves and plenty of sunscreen. Landis Valley will provide water and snacks (more info on Facebook). 7/7, 9-11:30 am; 7/11, 6-8:30 pm. July 15: Historic Fashion Show and Discussion—curator Sarah Buffington will present a program on 18th- and 19th-century clothing using antique and reproduction pieces (more info on Facebook event page). 6-8 pm. July 16-20: Summer History Camp—kids ages 6 to 12 will explore the village and learn about life and work in the community (more info and registration form. Register by July 5. 9 am-12:30 pm. Special Sunday Programming—Pirates in the Tavern! 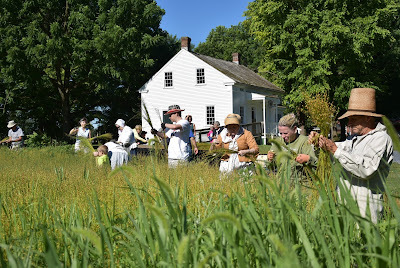 (living history theater) (7/8) and see what the cooks are up to in the kitchen (7/15). Included in regular admission. 1-4 pm. July 14: Yoga/dance classes—no experience is required to enjoy this combination of various types of dance and yoga movement. Two classes are offered - Shake Your Soul (10-11 am) and Shake Your Seat, where movements center around a chair (noon-1 pm). Click on the class you want for more info on registering. Cost is $10 per class. 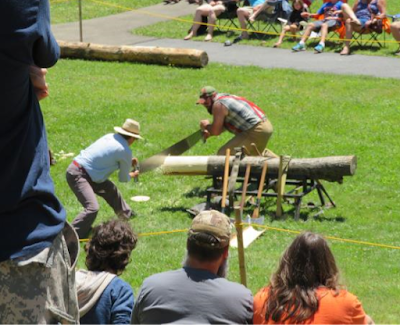 July 7-8: Annual Bark Peelers’ Festival—this hugely popular event recreates the 4th of July celebrations of Pennsylvania’s early 20th-century lumber camp workers and “woodhicks.” The schedule for this year's event is now available online. Admission is charged. 9 am-5 pm (events start at 10 am). NOTE: on June 7 at noon, a dedication ceremony for the relocated Webber cabin will be held (read more about the cabin project). July 10: Central PA Civil War Roundtable Series—the program is "Zouaves: America's Forgotten Soldiers." Donation requested. 7-8 pm. July 12-15: Annual People’s Choice Festival of Pennsylvania Arts & Crafts—celebration of arts and artisans held on the museum grounds (visit the festival website for details). Festival is free, $5 charged for on-site parking at PMM; regular museum admission applies to tour the indoor exhibits. Thurs-Sat, 10 am-9 pm (museum open 10 am-5 pm); Sun., noon-5 pm. Through July 8: Reading Railroad Days—offered in conjunction with the Reading Company Technical & Historical Society, this program features an enormous HO-scale model railroad and highlights Reading Company rolling stock in the Museum’s collection. Included in regular museum admission during regular hours. July 7: Escape Room—work as a team (of up to 10 people) to solve your mission and escape the barn. Two 60-minute games offered per day. Cost is $10 per person. 10 am-2 pm. July 14: Exhibit opening—"Answering the Call: Somerset County in the Great War" explores the impact of World War I from the home front to the front lines. Included in regular admission. On view through Nov. 11. POSTPONED July 14: Historic Hayride—hear stories of the local region while you tour the grounds by wagon. Two rides offered each day. Cost is $10 per person, $8 for members. 10 am-2 pm. Due to equipment and trail issues, this event is postponed. Keep an eye on Somerset's Facebook page for updates.